More and more companies are seeing drastic changes in the workplace. Work-life balance is an important goal for most employees, and companies are changing to account for this. One aspect that is quickly evolving as a result is office design and the rise of modular offices. Companies are incorporating flexibility in the workspace like collaborative meeting spaces, recreational rooms, and open-plan offices to encourage communication, teamwork, and coworker relationships. The appeal of collaboration and teamwork has impacted the layout of offices, and even the use of traditional desks. Benching consists of “bench-like” tables that accommodate multiple people. 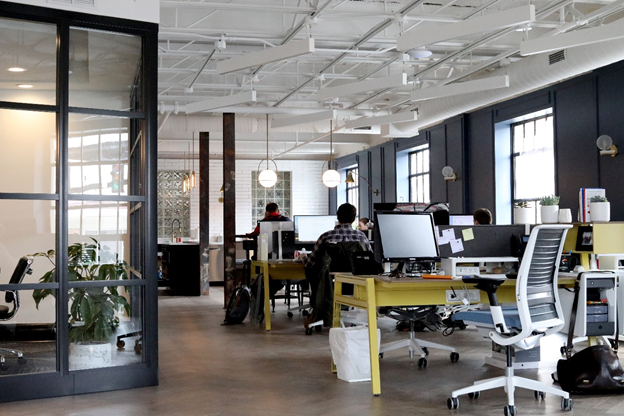 Cost savings is also a motivator for the use of open layouts – fewer walls and furniture allow companies to save money when designing their offices. Companies can also expect to cut spending when it comes to electricity and air conditioning. Finally, open-plan workspaces make it easy to accommodate new hires in the future. Biophilic design brings natural elements indoors and continues to grow in popularity across offices. This design trend includes placing plants around the office, creating “living green walls” completely comprised of moss or ivy, and even incorporating lighting and scents reminiscent of nature. The use of plants increase employees’ overall well-being. Additionally, living green walls help with LEED building certification and cost-savings since plants help with insulation. Companies are taking training into their own hands to increase the competency of their employees. Many provide professional development opportunities in-house. Technology, such as AI, and online trainings facilitate teaching new skills to groups of employees. A recent study suggests that overall spending on skills trainings in the U.S. increased significantly, and more companies are allocating resources to have dedicated training center on campus as it ultimately saves on outside training costs such as travel expenses. Modular buildings continue to be a viable solution for office space needs. Construction costs and completion time decrease significantly when using prefabricated buildings. In addition, modular offices allow exponential growth and mobility. It is easy to order an additional modular unit to accommodate new employees when businesses experience rapid personnel growth. Best of all, modular buildings can be customized to have an open layout and biophilic elements. At Wilmot Modular, we have experience creating temporary and permanent modular offices and training centers, Reach out today to learn more about how modular buildings can solve your office space and employees’ needs!